Bell’s palsy is the most common cause of facial nerve paralysis. Deinition: (Lower motor neuron lesion) LMNL facial palsy. 1- Vascular ischaemia: local vasospasm of vasa nervosa >> oedema of nerve sheath >> nerve compression >> secondary ischaemia & more damage. 1ry ischaemia may be due to exposure to cold draughts. 2- Viral theory: isolated viral neuritis, single manifestation of polyneuritis,or reactivation of herpes simplex. Incidence: The commonest cause of LMNL, 80 – 90 %. What are the symptoms and signs of Bell's palsy? It affects mainly middle aged adults, and affects both sexes equally. It may be precipitated by exposure, to cold air draughts, emotional stress, or pregnancy. 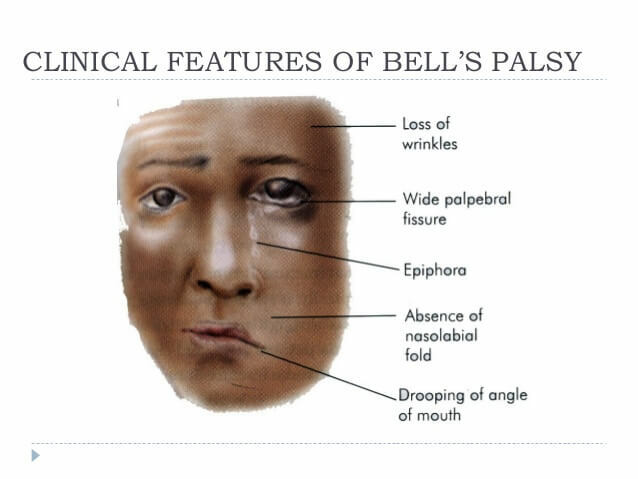 The diagnosis of Bell’s palsy is made by exclusion of all other etiologies of facial paralysis. 1- Unilateral LMN facial paralysis of sudden onset, which may be partial or complete, and reaches a maximum in few days. 2- Retroauricular pain may occur several hours before the onset of the paralysis. 3- A reddish chorda tympani nerve may be visible through the posterosuperior part of the T.M. 4- Metallic taste and hyperacusis. In prolonged,or recurrent cases CT & MRI to exclude facial neuroma. a) Vasodilators in 1st few hours to relieve 1ry ischaemia e.g. nicotinic acid, histamine, beta histine. - To decrease edema & inflammation. -Should be given early in tapering dose. -Start with prednisolone 80mg / day. -If no response after 2w give 2nd course. Indication: > 90% degeneration after 2weeks. Decompression by exposing bony canal & splitting the sheath from stylo mastoid foramen to level of compression. 4- Late cases: facial rehabilitation.